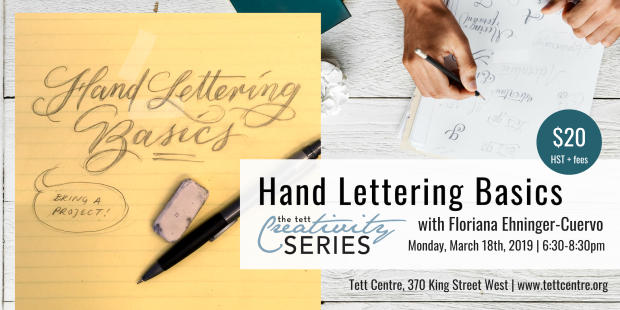 Learn the art of hand lettering with Floriana Ehninger-Cuervo at the Tett Centre for Creativity & Learning. This two hour sampler workshop will give you the foundation needed to start creating decorative handwriting. The first half will cover letterforms and some practice, the second on creating a small piece. For this purpose, participants are asked to come prepared with a short phrase or quote, an idea for a card, or a project of their choosing (jar labels, etc). Floriana Ehninger-Cuervo is a graphic artist, screen printer and handwriting revivalist. She believes in the union of art and words, the small ways art can enhance everyday life, and finding the humour of the situation. Sign up to get exciting news and updates delivered straight to your inbox.